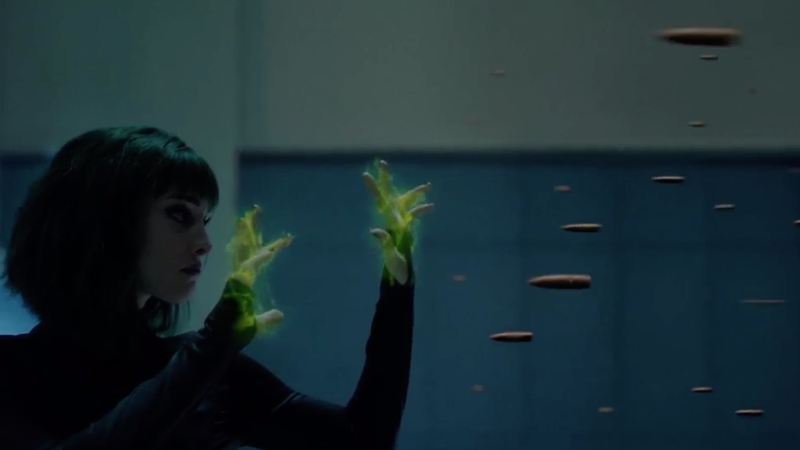 Lorna Dane, aka Polaris, catching a volley of bullets. Watching each episode of The Gifted is like receiving an X-Men-themed Secret Santa gift that you enjoy a surprising amount despite the fact that it’s, well, kinda cheap and not at all something you would have picked out for yourself. It’s the thought and heart that counts, after all. Continuing in The Gifted’s habit of paying homage to the X-Men rather than actually incorporating them into the show, this week’s episode, “iMprint,” give us a Frosty glimpse into the Stepford Cuckoos’ traumatic pasts and, surprisingly, introduced a new spin on one of the X-Men’s most useful tools. All the way back in The Gifted’s first season, when the Mutant Underground was still living in a somewhat stable headquarters, the show flirted with the idea of a Danger Room that more or less amounted to a bunch of mutants standing around in an abandoned warehouse where they could test out their abilities on whatever junk happened to be lying around. The most dangerous thing about that room was the very real possibility that someone might step on a nail and get tetanus, but this week’s Hellfire Club-focused episode revealed that over on the villainous side of town, the bad guys have a proper place to hone their abilities complete with hard light holograms. In preparation for their next major attack on human society that’s designed to inspired more civilian mutants to rise up, protest, and (if need be) use their abilities to strike back at their oppressors, the members of the Hellfire Club’s Inner Circle get in some quality time in the Danger Room, much to Polaris’ concern. While Reeva Payge refuses to tell Polaris exactly what they’re training for, the fact that the villain has her, Andy Strucker, and newcomer Twist facing off against squads of armed guards leads Lorna to the logical conclusion that they’re preparing for something that’s likely to get them all murdered. Polaris, Andy, and Twist training at the Hellfire Club. Still, though, the Danger Room session gives us a look at just how much more powerful the Hellfire Club’s recruits have become since defecting to the dark side. Now far more in control of his abilities, Andy’s able to knock back multiple guards with ease without destroying the building in the process. Lorna catches a barrage of bullets without breaking a sweat, and Twist, whose ability is to telekinetically turn things...inside out, uses her powers to kinda-sorta trip the hologram guards up in a way that feels like The Gifted is holding back on showing us just what all she can do. Like the X-Men’s classic Danger Room, the Hellfire Club’s answer to it is as minimalist in appearance as it is technically advanced. Lorna, Andy, and Twist know they’re not fighting actual humans here, but they’re realistic to the point where they might as well be, meaning that Reeva wants them ready to kill of necessary. Polaris’ misgivings seem to suggest that by the season’s end, she’s going to realize that she doesn’t want to become a cold-blooded killer like her father. But Twist? There’s more than a good chance that she’s going to end up using her odd powers to literally turn a person inside out, which would be more of the most horrifying deaths any comic book show or movie ever had the audacity to show on screen.